Nite Wave Returns to JAZZBONES in Tacoma, WA! Nite Wave Alter Ego’s Tiger Tiger (Duran Duran) and Whiplash Smile (Billy Idol) come together for a tribute to 80s New Wave and Rock! Nite Wave returns at McMenamins in Bothell, WA for an 80s Prom Night! June 7th at Tractor Tavern in Seattle! Friday, June 28th! Show starts at 9:00 pm! FREE ENTRY! Nite Wave returns to Taste Edmonds this Summer! Catch us on Friday, August 16th from 6:30-8pm! Featuring Nite Wave w/ Seattle’s Only Tribute boy Band #All4Doras! 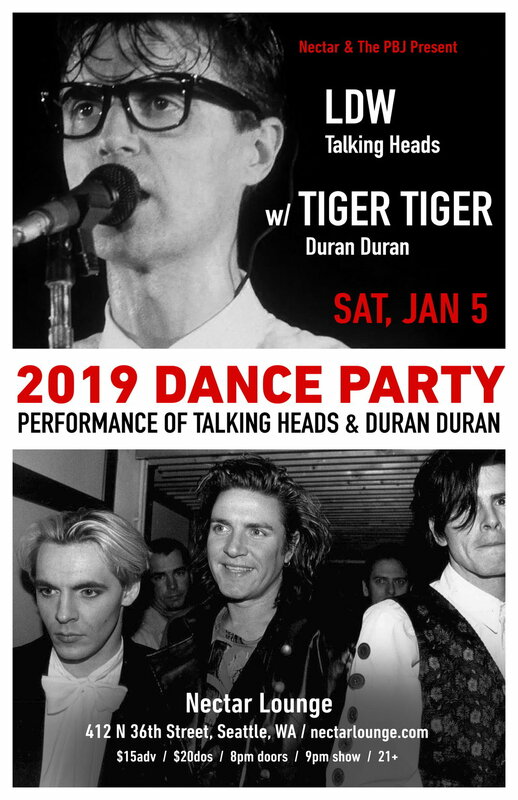 Tiger Tiger, our Duran Duran Alter Ego, will be opening up fpr Talking Heads tribute, Start Making Sense! We hit the stage at 9 pm Sharp! Nite Wave at The Swiss in Tacoma! Doors are at 8 pm, Show starts at 9 pm! Saturday, March 9th starting at 9 pm! Nite Wave returns for the Best 80s Party Ever! (So Far) w/ DJ Baby Van Beezly! Tiger Tiger (Duran Duran) Tribute opens up for Talking Heads Tribute Life During Wartime! NITE WAVE AT ilani Casino in Ridgefield, WA! Nite Wave returns to the Saint’s & Sinners Costume Ball on Friday, October 26th! We hit the stage around 9 pm! Nite Wave returns to Nectar Lounge on Sunday, October 21st! Come get your 80s Prom on for this special Sunday Encore show! The Best 80s PROM Ever! (So Far) returns to Nectar Lounge in Seattle on October 20th! Nite Wave is joined by multi-platinum recording artist and founder of legendary 80s group The Go-Gos, Jane Wiedlin! She starred in Bill + Ted's Excellent Adventure as Joan of Arc and the cult 80s classic Clue as the Singing Telegram Girl. She will be joining Nite Wave on stage to perform some Go-Gos classics LIVE! Nite Wave's Side Project (Tiger Tiger - Duran Duran Tribute) returns to The Crocodile with Purple Mane (Prince Tribute)! Nite Wave makes their debut at Kirkland Summerfest! We headline Saturday Night and will be playing 9-11 pm on the Kirkland Waterfront! Nite Wave Live at Pioneer Park in Puyallup. Show starts at 6:30 pm! Nite Wave brings the 80s New Wave Party to Lakewood Summerfest! Tiger Tiger (Duran Duran Tribute) Live at Tulalip Casino! Sunday, June 3rd from 530 - 7 pm! Nite Wave returns to The Tractor Tavern in Ballard! Nite Wave Live at the QCC! Final Show at CAPPS CLUB IN KENMORE! DOORS AT 8 PM, SHOW AT 9 PM!